Lady Gaga had an emotional night on Sunday – first giving a tearful speech at a film award ceremony, but then rushing to be with her beloved horse after discovering it was dying. The night started with the star sharing the best actress prize with Glenn Close at the Critics’ Choice Awards. But she wrote on Twitter: “Just after the show I learned that my dear angel of a horse, Arabella, is dying. Media captionLady Gaga and Glenn Close were awarded Best Actress at the Critics Choice awards. The singer and actress added: “She is and was a beautiful horse. Our souls and spirits were one. “When she was in pain, so was I. I will never forget the moments we shared. Long hikes together, galloping through the canyons. Feeding her cookies. Earlier, she shared some warm moments with Close – one of her rivals for the Oscars – at the Critics’ Choice ceremony in Los Angeles. 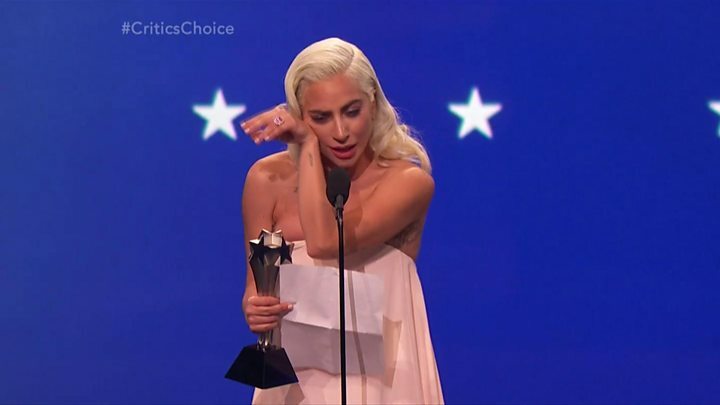 The best actress award was shared between Gaga for her role in A Star Is Born and Close for The Wife. Gaga broke down in tears on stage, and also revealed that Close is “good friends” with her mum. She also won best song for Shallow. Britain’s Olivia Colman – the other main contender for best actress at the Oscars – won a separate prize for best actress in a comedy for period comedy-drama The Favourite. The Critics’ Choice winners are among the key indicators for who might triumph at the Academy Awards on 24 February. Christian Bale won both best actor and best actor in a comedy for Vice. Roma, Alfonso Cuaron’s black-and-white portrait of the life of a maid in Mexico City in the early 1970s, was named best film. The ceremony also honours TV shows, and the other British winners included Matthew Rhys, Ben Whishaw and Thandie Newton.